Alex Wide started playing the horn at the age of 7 in Southampton. He went on to study at the Junior Royal Academy of Music before moving on to the Guildhall School of Music and Drama where he received both his undergraduate and masters degrees with first-class honours. Since graduating in 2014 Alex has forged a varied freelance career. Alongside Britten Sinfonia, Alex is regularly invited to play as guest principal horn by the Royal Philharmonic Orchestra, BBC Concert Orchestra, Philharmonia Orchestra, BBC Philharmonic Orchestra, London Chamber Orchestra, London Mozart Players, BBC Scottish Symphony Orchestra, London Sinfonietta and RTE Symphony Orchestra. Alex also performs regularly with the London Symphony Orchestra, London Philharmonic Orchestra, Orchestra of the Royal Opera House, and in West End shows including 42nd Street and Wicked. Chamber music makes up an import part of Alex’s career. Recent engagements include a performance of Beethoven’s Septet with Emma Thompson and Friends, and regular concerts with the Tony Halstead Horn Ensemble. Recent solo engagements include performances of Mozart’s Fourth Horn Concerto and Glière’s Horn Concerto, as well as recordings of Schumann’s Konzertstucke and two new commissions written by Tim Jackson with members of the Tony Halstead Horn Ensemble and the London Chamber Orchestra. 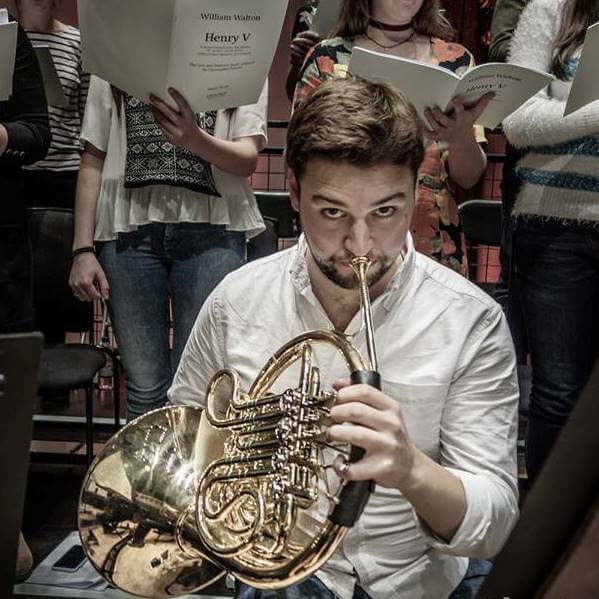 Alex enjoys leading an active role in the Britten Sinfonia Academy, and is also a horn tutor for The Brass Academy.